A shopping tour is a fantastic way to discover the best places to shop on the island, especially for locally made goods. Tour the Pelican Village arts and crafts center to see craftsmen at work, and purchase authentic local goods. If you're planning on a renting a car, then we recommend a custom shopping tour with stops at Earthworks Pottery, H P Batik Studio, and Hamiltons Pottery. You'll see the local potters at work, chat with a batik artist, and purchase functional and decorative creations. Another benefit to renting a car is easy access to the excellent shopping malls across the island. Shop in air-conditioned comfort and enjoy duty-free savings of up to 40% off regular prices! We also recommend visiting a Farmers Market, where you will find a wonderful selection of craft and art by locals and expats living on the island. 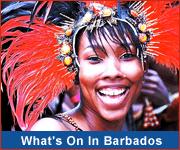 Check the What's On In Barbados events calendar for the dates & times of these markets. 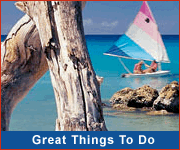 Visiting Barbados during a Caribbean cruise? The Bridgetown Cruise Terminal offers an excellent selection of shops and booths, with some offering duty free shopping.